Nel giorno atteso per il discorso sullo Stato dell'Unione del presidente Obama, Defense One pubblica un completo rapporto sullo stato della difesa e delle forze armate USA. Inside the military services that have to be ready to carry out the U.S. response to any conflict, planners are moving forward with some of their own changes so that they don’t have to wait for uncertainty. In 2015, there will be new chiefs of the Army and Navy. Until then, the Army is expected to win its request to scrap the downsizing plan it wanted one year ago, thanks to the high demand for rapidly deployable troops to the world's hotspots. The Army also will proceed with a complete overhaul of its helicopters. The Air Force is pressing on with the F-35, with no alternatives at this point, while calling for more drone pilots. That service also will continue to mend after repeated scandals in its nuclear force and sexual assault issues. The Navy spent the winter finally scrapping its ship of the future, the littoral combat ship, or LCS, and rebranding it as an up-gunned frigate, while the service explores how to keep top personnel in the modern age. The Marines continue to be that "middleweight" amphibious force its leaders prefer, but the president and Corps leaders keep sending them deep into landlocked countries as tip-of-the-spear reaction counterterrorism forces. The new commandant is expected to lay out his plans within weeks. Nobody wants more certainty about their futures more than the men and women in uniform. Congress and the president may finally move them beyond the sequestration era, easing fears in pocketbooks and at PXs. But the world certainly won't be tipping its hand anytime soon. That means it's up to the new stable of decision makers – from likely next Defense Secretary Ash Carter to McCain and the new Joint Chiefs to come – to figure out how the state of defense can remain one that is prepared for anything, anytime, anywhere. Because if past is prologue, that’s how often U.S. soldiers, sailors, airman and marines must be ready to fight in the new era. La notte del 22 settembre 2014 un F-22 Raptor, il nuovo caccia stealth da superiorità aerea dell'aviazione americana costruito dalla Lockheed Martin, è stato usato per la prima volta in un teatro bombardando con successo una postazione dello Stato Islamico ad Ar Raqqah, in Siria. GQ ha intervistato Brandon Bryant, aviere di prima classe dell'aeronautica degli Stati Uniti. Una delle prime reclute arruolate con il compito di pilotare droni da ricognizione e attacco. He was an experiment, really. One of the first recruits for a new kind of warfare in which men and machines merge. He flew multiple missions, but he never left his computer. He hunted top terrorists, saved lives, but always from afar. He stalked and killed countless people, but could not always tell you precisely what he was hitting. Meet the 21st-century American killing machine. Dopo 15 mesi in orbita è rientrato alla base di Vanderberg, dopo la sua seconda missione, lo shuttle dell'aviazione militare americana X-37B. Ora anche l'aeronautica militare degli Stati Uniti ha il suo shuttle. 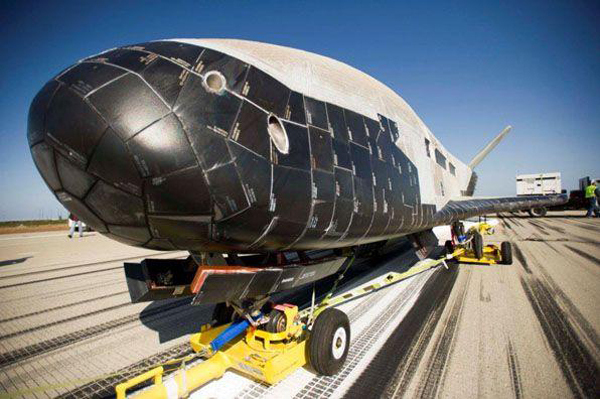 L'X-37b, pilotabile da terra, è in grado di restare in orbita per più di 200 giorni e ritornare alla base di Vandenberg atterrando come un normale aereo. L'impiego è top-secret, voci incontrollate parlano di armamenti antimissile e capacità di abbattere satelliti e apparecchi spia. In pratica un caccia da superiorità spaziale.